Sniper EFI’s new 90mm billet aluminum throttle bodies are designed as a direct fit for the Fabricated Race intake manifolds. 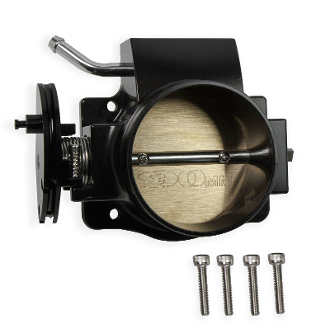 Don’t let the low price fool you, these are feature packed throttle bodies available in both bright silver or black anodized finishes. The enlarged bore sizes allow for increased airflow to support your higher horsepower needs, a progressive throttle pulley enhances low speed drivability and a double return spring provides solid and secure throttle control feel.